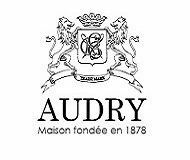 The tale began when A. Edmond Audry set up his Cognac house Audry Cognac in 1878. It was thanks to his knowledge and hard graft that the family traditions and skills were handed down through the generations as the years passed. He passed the Cognac house to his daughter, Odette Audry, who married Aristide Boisson. Together they continued to produce cognac until Aristide’s death in the 1950s. At that point it seemed that the story of Audry Cognac was to be no more, and the house stopped selling Cognac. However, with foresight that was almost prophetic, some of the oldest stocks were stored in the belief that one day the house would begin to produce eaux-de-vie once again. Fast forward to 1978, when Bernard Boisson decided that the time had arrived to rekindle a family tradition, and Audry Cognac was reborn. With the advantage of some extremely old Cognacs in his cellars, it comes as no surprise that Cognac Audry soon began to grace the tables of top restaurants around the globe. Targeting an exclusive niche market, Bernard Boisson’s Cognacs began to be sold through some of the world’s most exclusive retailers, directed firmly at the top end of the Cognac market. Thanks to the auspicious comments made in Time Magazine, along with those in other prestigious publications and guides, Cognac Audry has had to increase the amount of Cognacs produced. This in turn has seen the brand’s profile raised in all corners of the globe. New York, California, Canada, Belgium, Norway and The Netherlands are just some of the world’s countries and regions where Cognac Audry is sold and enjoyed by connoisseurs. The marketing side of Cognac Audry has embraced both the virtual and the physical world over the past few years. Traveling around the globe, providing tasting sessions in destinations such as London, Geneva, Paris, Dallas, Boston and New York has done much to raise awareness of this artisan brand. In the capable hands of Bernard Boisson, the great grandson of the original founder, Audry Cognac remains to this day a small family run business with far from small aspirations. Audry Cognacs are produced from grapes from both the Grande and Petite Champagne growing regions. From the Audry Napoleon Cognac right through to their flagship product, the Cognac Audry La Tres Ancienne Grande Champagne Reserve Aristide, these are Cognacs targeting those who seek the finest that France has to offer. Owner and Cellar Master Bernard Boisson has certainly made his forefathers proud, with recommendations and praise for his Cognacs being published in trade and wine publications worldwide. Audry Cognac ranges in price from around 75 Euros per bottle for an Audry XO Cognac to around 200 Euros for a bottle of Audry La Tres Ancienne Grande Champagne Reserve Aristide. Audry Memorial is unbelievably complex with notes of raisin , plums, tar, tobacco, leather , some light fire, loooong finish and seems to ahve zero sugar dosage. Really mature, adult drink. None of the nauseating sweetness of Normandie Mercier and other favorites of the beginner cognacs. This Audry Memorial is in a league with Delamaine Tres Venerable and stands taller than Deleamaine in complexity and layers of flavours. It is also less rancino than Delamaine if that is your thing. Superb, simply superb.